The best thing about comfort food is not actually have to cook it. 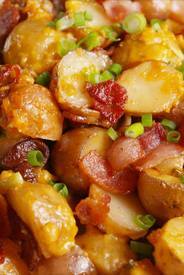 Just load it into your crock pot and whalaa- hours later, potatoes loaded! Oh, and did I tell you, BACON!! !